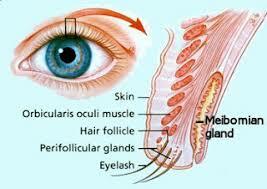 Meibomian glands are modified sebaceous glands that are arranged vertically within the tarsal plate. The interactive force of an eyelid blink causes meibum to be excreted onto the posterior lid margin. This oil protects the eyelids from maceration and creates a seal when the eyes are closed. As meibum interacts with the tear film, it reduces surface tension and enhances the tears by spreading them evenly, creating a smooth refractive surface and maintaining a consistent quality of vision. The white bumps in the lash line, are typically caused by secretion of too much oil or the oil has become thickened, which results in bumps along the lash line. It is speculated that excess meibum can be one of the causes of lash thinning or loss. Those with the bumps need to understand that it can be a chronic condition and that it requires a regular, if not daily, lid hygiene regimen. A study out of Oxford University recommended using warm compresses; heat should be applied to the eyes for two to 10 minutes. This warms the meibum, allowing it to flow more freely, and helps soften lash debris. Massage the lids to stimulate the excretion of meibum and debris from deep within the glands. Marilyn’s Optometrist, Dr. Stuart Bark recommends using OCuSOFT Plus eyelid cleanser pads after removing makeup and upon rising in the morning. If the bumps become bothersome and enlarged, he can express them for you. Another suggested method is the use of Thermalon Dry Eye Moist Heat Compress mask. When Marilyn removes her makeup, she uses a mixture of “No-More Tears” baby shampoo diluted with distilled water to gently scrub the lash line until all residual makeup is gone. Dr. Bark is one of the few doctors that I know of who will express the bumps. In-office expression of the meibomian glands can provide significant relief because the backed-up glands can cause discomfort and dry eye syndrome.